Wolfsburg - VfL Wolfsburg breathed new life into the title race with a thrilling 4-1 win over Bundesliga leaders FC Bayern München at the Volkswagen Arena. Eight points are now all that separate the top two after a brace apiece from Bas Dost and Kevin De Bruyne capped a near-perfect team display, the only blot to the copybook being Bayern midfielder Juan Bernat's fortuitous second-half strike. The Volkswagen Arena paid tribute to late Wolfsburg midfielder Junior Malanda, who was tragically killed in a car accident on 10 January, with a stirring minute's applause prior to kick-off. A more traditional minute's silence followed, with fans in the Nordkurve displaying a touching banner reading 'forever in our hearts' whilst holding up green paper hearts in an overwhelming, pre-planned piece of Bundesliga choreography. The celebrations continued once the contest got under way as the hosts took a surprise fourth-minute lead. De Bruyne collected Daniel Caliguri's long ball and had the presence of mind to pick out the unmarked Dost, who sent a tidy finish into the bottom corner for his third league goal of the campaign. The league leaders responded with efforts from Bastian Schweinsteiger, Robert Lewandowski and David Alaba, but Diego Benaglio was equal to every one of them. 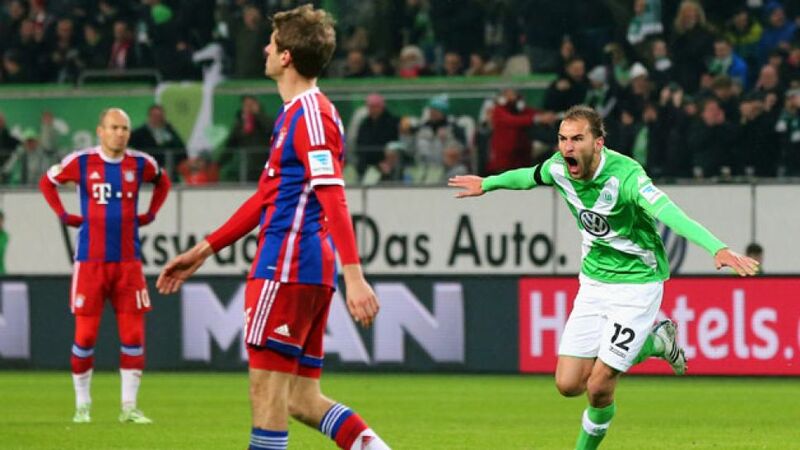 Unable to get a grip on the midfield, Bayern wavered in the face of a handful of quintessentially Wolfsburg counters. Maximilian Arnold was very nearly the lucky recipient of a stunning low cross from creator-in-chief De Bruyne, who himself went close with a swerving drive from range. The Wolves were executing Dieter Hecking's incisive game plan to perfection and deservedly doubled their lead on the stroke of half time courtesy of Dost's outrageous 18-yard volley. Bayern had only conceded four league goals all season prior to Friday's clash, but worse was to come in the second half. The flag stayed down as De Bruyne collected Arnold's inch-perfect ball over the top, with the Belgian international holding his nerve and calmly slotting beyond a disgruntled Manuel Neuer for 3-0. Pep Guardiola's side hit back almost immediately through Bernat's first Bundesliga goal, albeit with a massive helping hand from Naldo. Arnold spurned a glorious opportunity to restore the Wolves' two-goal cushion after spooning Dost's clever knock-down over the crossbar from just two yards out, before Arjen Robben reminded the partisan home crowd they wouldn't have things all their own way with a fierce free kick that Benaglio did well to save. Rather than sit back and soak up the pressure, Wolfsburg sought out the knockout blow and duly made it four with 17 minutes still to play. Arnold sent De Bruyne through on goal, but few would have expected the Belgian international to stick the ball away with quite such aplomb - and on his supposed weaker left foot at that. Missed chances from Robben and veteran substitute Claudio Pizarro summed up a forgettable night at the office for the visitors.